Focal Earth, a specialist in rail logistic solutions has developed an ingenious idea to utilise the pre-paid wasted space on the Rail Vehicle Transport (RVT) wagons during the in-bound journey to automotive manufacturing plants. 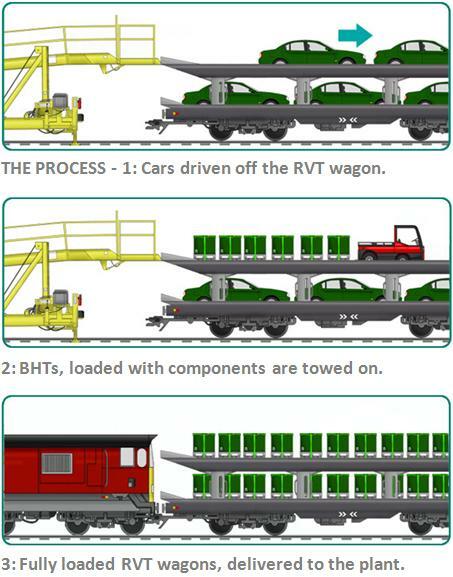 The idea is to load the empty RVT wagons with trolleys that can carry components such as engines to the plant. The trolleys can then be towed off by tugs used at the terminals to transport the components to the necessary location. The system is ideal for the ‘Just In Time’ inventory strategy and can help to reduce transport costs. The development of the trolleys, called the Back Haul Trolleys (BHTs), was on track until the automotive companies asked to see Focal Earth’s Failure Modes & Effects Analysis (FMEA). Without any prior experience of performing an FMEA, Focal Earth turned to MAS West Midlands and the CE Marking Association for help to produce an FMEA and a test plan to enable a robust design to be developed. The aviation industry developed the FMECA process, and today this process simplified to FMEA is used through a wide range of industries across the world. FMEA is a process for analysing potential failure modes related to the product, their potential effects and potential causes and the methods to detect the failure. Each potential failure is rated to give a risk score to help prioritise and address the potential risk. The final stage is to act on prioritised actions and then to re-assess the potential risk ensuring that the potential risk has either been removed or reduced. A knowledge transfer programme was quickly set up to provide Focal Earth with the necessary information so they could follow the FMEA process, to provide assistance to identify and reduce risks, develop a robust test plan and to compile a comprehensive FMEA report on the BHTs. During the programme, Wemtech and Focal Earth brainstormed and documented the functions, potential failure modes, effects, causes and design verifications, the latter leading to the production of a test plan. Finally with the aid of a relevant standard (EN 12312-11:2005) it was possible to identify which functions had high risks leading to recommended actions to assist Focal Earth developing a robust design. Focal Earth now has a fully documented FMEA report looking at their highest risks to help them reduce the risk of a failure together with a test plan to test for potential product weaknesses. In addition, they now have the knowledge and experience to carry out any future FMEAs themselves. So once again, the project is back on track and going full steam ahead. "Particularly helpful... we would have no hesitation in recommending the CE Marking Association"